As a teacher I’m always looking for ways to motivate my students to review their old repertoire. Lately I have been offering to my students the “Suzuki Book Graduation Party Challenge”. It is well documented in the teaching community that I have serious skills in the kitchen. To my violin students I pose this challenge: If you are willing to host a party and perform all the songs in any Suzuki book I promise to bake a fancy “3 star Michelin style” dessert for up to 25 guests. Those who are following my blog may recall last month’s entry about my student Eden’s Book 1 Celebration ( http://wp.me/p1wKkf-16 ) which featured my strawberry shortcake. This time my student Deborah had just completed Viola Suzuki Book 4. Approaching the more advanced repertoire, the concert would revolve around performances of all 4 movements of the Telemann Viola Concerto in G and all 4 movements of the Telemann Concerto for 2 Violas…a formidable challenge indeed. Deb was easily up for the challenge so I decided to pull out a few special tricks for her 3 star Michelin dessert. July always reminds of summer camp in the California mountains and sitting around the camp fire singing cheezy folksongs and eating camp snacks. 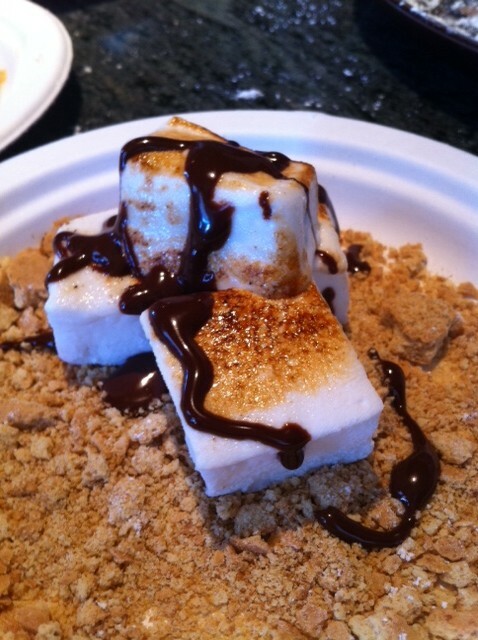 My favorite camp snack is S’mores..that wonderful combination of roasted marshmallows graham cracker crumbs and melted chocolate. For Deborah’s recital, I decided to make an upscale deconstructed version of this classic summertime tradition. In my version, I make my marshmallows from scratch…if you’ve never had a handmade marshmallow, you have never eaten a real marshmallow…the texture & flavor is something that transports you to another dimension and is nothing like the stuff you buy in plastic bags. Marshmallows take a long time to settle down once most of the active preparations have been completed so I visited Deb’s house the day before so that I could make the marshmellows ahead of time with the help of her and sisters. The next day was our performance. Deborah played wonderfully as usual. She invited 6 of her friends over to share in the music making and dessert eating. After the performance…dessert assembly. Plates were dusted with graham cracker crumbs. Freshly sliced marshmellow cubes were positiion 3 to a plate and then bruleed with a propane torch to give us that upscale roasted flavor. Final touch, a drizzle of chocolate ganache. The perfect ending to a wonderful day of music making. After dessert, the girls decided to go swimming and the whole event transformed itself into a pool party. 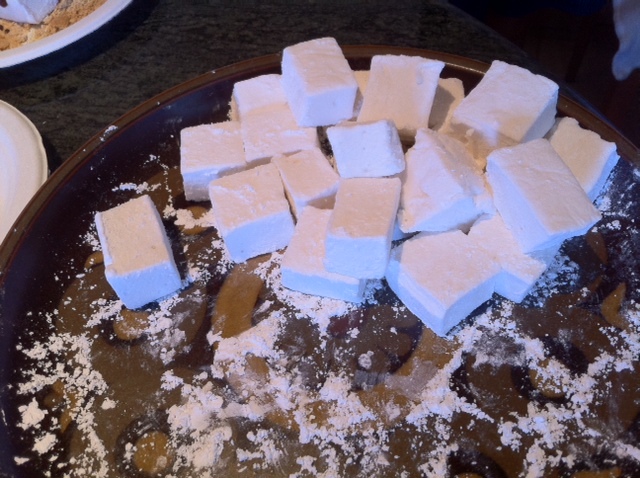 I did not swim…I decided to finish the few remain marshmallows…I aways try to make a few extra for myself.